You must sign into your myHangout account in order to contact FiveStringPop. My daughter-in-law scheduled several additional activities, one of which was a last minute decision: the Louisville Street Faire on Friday night. What an awesome way to finish my first visit to the area: a concert by the NGDB!!! Thank you so much for your gift to the banjo world, the bluegrass genre, and especially your contributions to all that is NGDB. My son and I have attended very few concerts together. Probably none in which there was a true, shared appreciation of the music and for that matter, each other. Friday night was different. The entire week was different. Thank you for all that you communicate through your music. It does make a difference. FiveStringPop has 167 friends. View entire friends list. -> 2008 Smith Walnut Legend . . .
-> 1977 Alvarez Whyte Eagle Model 4310, w/ Kyle Smith set-up . . . . . .
Flatt & Scruggs, JD Crowe, John McEuen, Osborne Brothers, Don Reno, Tony Trishka, Bela Fleck, Bill Keith, Bobby Thompson, Bill Foster, Rual Yarbrough, Forrest Tussey, Mike Taylor, Mike Mason, Scooter Muse, Gary Francis, Shannon Vinyard, Grant Steele, Three On A String, Peter Wernick, Run C&W, The Cleverlys, and Crippled Creep & the Colbert County Cut-Ups. During 1971, I heard both Bill Foster of Florence and Rual Yarbrough of Muscle Shoals play the banjo, and was immediately hooked on their music. By late 1971, Dad bought me a Harmony Reso-Tone, open back, skin-head banjo for $35 in a pawn shop in Hiawassee, GA. I took lessons from Terri Cantrell at Cantrell’s Music starting in Feb. 1972, for about a year. During that time, I bought the Earl Scruggs and the 5-String Banjo book and started learning tunes out of the book, independent of the lessons. I bought lots of records back then, and used my brother’s turntable to slow them down from 33-1/3 rpm to 16-2/3 in order to figure out tunes and songs or variations that were not in his book. The only time Mom ever complained (that I can remember) was when I spent half a day with my knees to the turntable playing Nashville Blues at half speed. The first “gig” I got was playing at Mitchell-Hollingsworth nursing home in Florence. My brother played his electric guitar while I played my Harmony! I guess we had a captive audience. I played once or twice for the history club at Bradshaw High School and collected local folk songs for an English class “foxfire” style project. All of these events combined my “blossoming” talents with those of Chip Lazenby, a fellow student and comic who is now a veterinarian extraordinaire, practicing in Florence. He taught me my first harmony parts so I could sing the songs’ choruses with him. I went to Auburn University in the fall of 1974. There were lots of banjo pickers there, some with very nice instruments. I remember Gary Francis with his Show-Bud masterclone, Shannon Vinyard with his Gibson bowtie / archtop. There were several others. Since I was still beating away on my Harmony, I learned to play a little guitar to accompany the better players around me. In 1977, I met a band that needed a banjo picker. After a practice or two, the bass player drove me to Dalton, GA to spend my summer’s wages on an Alvarez Whyte Eagle. 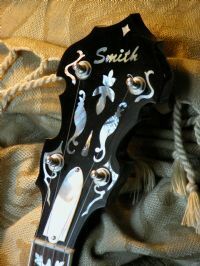 With a tight, clear head stretched over an arch top tone ring, the tail piece cranked down pushing the strings against a thinned bridge, that maple, 2-pc flange banjo could break glass. Seemed most of them were set up like that back then. I picked with Forrest Tussey and the other band members for a little over a year and a half, also playing with a band of other college kids during that time. My enthusiasm slowed somewhat when I got married. When a change in the grade point system was announced that would further ruin the record I had obtained at Auburn, I became very focused at getting out of there and abandoned the bands. Graduation was like a pardon! Just before I graduated, who should show up for vet school but… Chip Lazenby!!! By the early to mid 1980’s, I had kids and became more heavily involved in church, helping in the music and children’s ministries. As contemporary praise and worship and the accompanying choruses became more popular, I could tell the banjo wasn’t working like it had on the hymns. In 1983, I replaced the 10-ply rim and arch top tone ring with a First Quality 3-ply rock maple professional series rim and flat head tone ring. Bill Sullivan also machined the heel of the neck and did some minor touch up work. I was very pleased with the results. Much of the harshness of my banjo was gone and it seemed to blend again. Soon afterward though, I set the banjo aside to play acoustic guitar for praise and worship. From around 1990 to about 2003, I either played guitar or led worship while playing guitar for praise and worship. For a total of six years, I led worship at First Assembly of God, in Muscle Shoals, AL. In 2003, as my elderly parents required more and more attention, I set aside the guitar and relinquished all responsibilities outside the family, other than employment. Around the holidays of 2006, a nephew asked me about playing the banjo and where to get one. I pulled out the Harmony and the Alvarez and showed him a few things. He took home the Harmony and my Scruggs book. I searched the internet for “how to buy a banjo”. I was awestruck at the volume of information on the internet; in particular, I remember the “banjo wizard” and of course, Banjo Hangout. After Mom died Valentine’s Day, 2007 I became more interested in the banjo again, hoping to encourage Dad and give us something to talk about and possibly enjoy together. I am amazed at the wealth of knowledge, products, and services available to today’s banjo player. After pestering the poor man to the point he was most likely reluctant to meet me, I visited Kyle Smith in December of 2007, while on a holiday vacation in the Smokies. He performed “the works” on my Alvarez. He was very patient, talked banjo, and allowed me to watch all but his “secret ingredient”. I was absolutely astounded at the difference in the tone, timbre, and reflexive pop the instrument produced. I was so inspired by his work and its affect on my practice and motivation that in April, 2008, I took delivery of a very special Smith Walnut Legend. It seems I’ve come full circle in a weird sense. I lost Dad on June 13, 2009, in the very nursing home in which I played my first gig. On July 9, I played in my first jam in a long, long time. I’m hoping I can influence the grand kids to play music. Maybe one day, I can play in a style that will blend with contemporary praise and worship. There is nothing like worshiping the Lord.